Paints have been manufactured since prehistoric times, but until recently they were highly expensive and thus were mainly used for artwork. It is only since the nineteenth century that houses have commonly been painted. Today paints are used for colouring and protecting many surfaces, including houses, cars, road markings and underground storage vessels. Each of these different applications requires a different sort of paint, and it is these differences in composition that are the focus of this article. Paint is essentially composed of a binder, pigment and solvent. Paint is essentially a mixture of a binder, which sticks the paint to the surface, pigments, to give the paint colour, make it opaque and occasionally to prevent corrosion and solvents to make the paint spreadable. Pigments serve three main functions: the optical function of providing colour, opacity and gloss; a protective function with regards to the surface underneath the paint and with regards to the binder which can be destroyed by UV; and a reinforcing function for the paint itself in that they help the binder to stick. Pigments are composed of tiny solid particles less than 1µm in diameter, a size that enables them to refract light (light has wavelengths between 0.4µm and 0.7µm). and in contact with the solvent. Surrounding pigment particles is a layer of moist air and, in some cases, other gases. To bring the pigment into contact with the solvent this layer has to be displaced, and this displacement is known as wetting. If a pigment is not properly wetted in a paint it may result in colour streakiness in the finished paints, thus solvents and pigments must be chosen that result in a well wetted pigment. Wetting and dispersing agents are used to improve the wetting properties of the resin/solvent system. resin-based paints a variety of organic compounds are used with the most common being mineral turpentine. In addition they have greater tinting strength (i.e. less pigment is required to get an equally strong colour), better gloss development and some absorb UV light, preventing it from damaging the binder. However, inorganic pigments are also widely used as they do not bleed, are heat and light stable and are much cheaper than organic pigments. In addition they are used for some specialist pigments (such as anti-corrosion pigments), and for black and white pigments, as it is not possible to get pure black or white organic pigments. One such white pigment, titanium dioxide, is widely agreed to be the single most important pigment in use today. It is the strongest known pigment in terms of both opacity and tinting power which, coupled with its pure white tint and its fine particle size, means that it can be used as an opacifier to prepare films with a high hiding power and reduced pigment content. This has resulted in paints with much improved elasticity and hence improved durability. A number of inorganic compounds are used as pigments in paints. Many of these compounds are colored due to the absorption of light energy by electrons in d orbital subshells. Meaning we see colors depending on which wavelengths of light are not absorbed by the compounds. 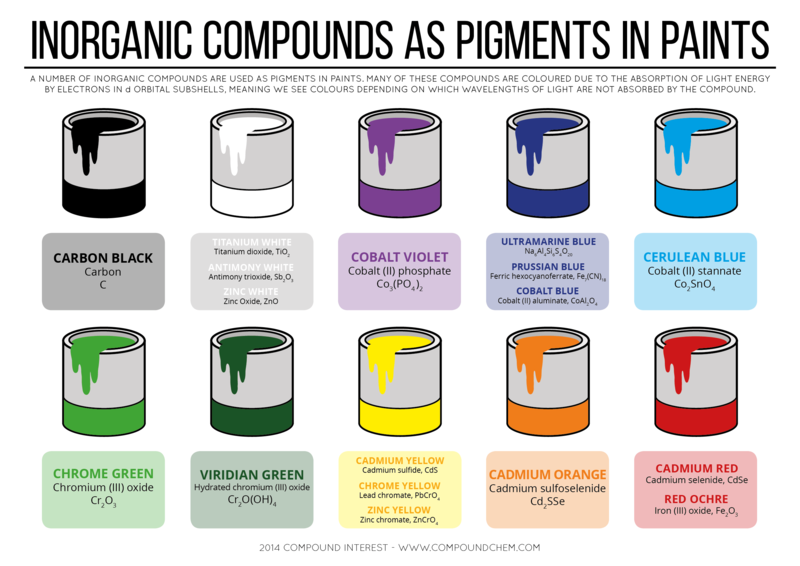 Here is an interesting infographic from Compound Interest on Inorganic Compounds as Pigments in Paints, which I’m going to share here. In this infographic these inorganic compounds has been shown with the colors which they responsible to produce. best site i have ever found for the free books.These books helped a lot for our studies. thanks for sharing.ALLAH bless u and your team always.